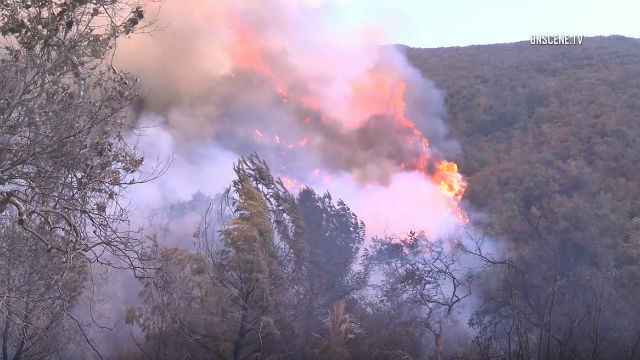 Crews are reporting more progress in the battle against a raging wildfire that has ripped through the Cleveland National Forest and has damaged or destroyed 14 structures in Orange and Riverside counties. The Holy Fire has now charred 22,714 acres and is 52 percent contained, fire officials reported Sunday night. Full containment is expected Friday. Mandatory evacuations remain in effect for the Riverside County communities of Glen Eden, El Cariso, Blue Jay and Rancho Capistrano. The Trilogy community in Riverside County is under voluntary evacuation. According to fire officials, the blaze will continue spreading to the northeast. The weather may help bring some reprieve as a low-pressure system moving into the Pacific Northwest will bring cooler temperatures and increased humidity to the local area though Monday, but wind will continue to gust up to 20 mph along mountain ridges. The fire broke out Monday in Orange County’s Holy Jim Canyon, and an arson suspect has been arrested.